I've been having a bit of a rough time with anxiety lately, but I was absolutely thrilled to see all the lovely edwardian clothes Skell has made. 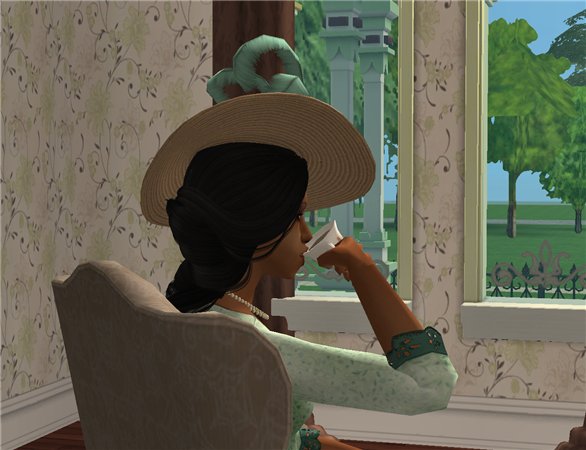 Having a neighbourhood for nothing but tea parties and pretty clothes, gardens, and houses is very relaxing. 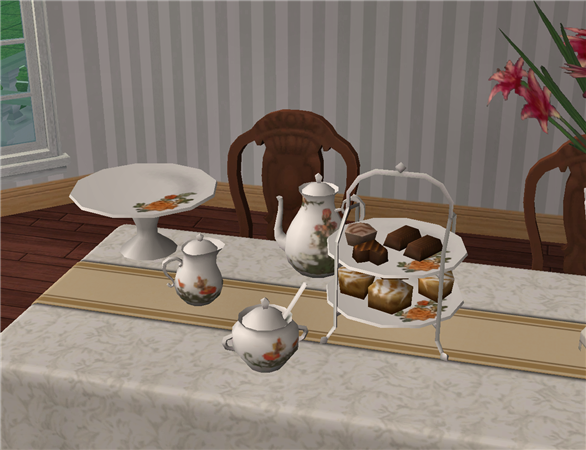 I can't take much credit for this, the meshes are from Maxis and the tea set itself is by Jasana (http://modthesims.info/d/221471) who was kind enough to let me clone it. Recolouring is as easy as recolouring the master files but any requests to do anything else should go through Jasana, as per her TOU. The Free Time set should be BG compatiable bacause I couldn't figure out how to double-slave the texture, but I included all the basic EAxis recolours. I also included a decorative, separated version of the Old Mill set, including a recolour of the FT pottery plate to go with this set. By lucky chance the animation works perfectly. Sims will hold the cup with their index finger curled through the ear, and neatly bring the cup to their lips. The FT cup looks a bit more muggy. This is quite lovely...can't wait to use everything. Thank you! Do hope things get better with your anxiety. Not sure if you already know or do these things, but limiting and/or eliminating caffeine can really aid in reducing anxiety. Deep breathing routines and finding stress relieving (glad the Sims work for you) activities do wonders as well. Might sound silly, but try coloring books (there are a number of them for adults and are geared towards stress relief...which can be an anxiety trigger too). Thank you for such a thoughtful reply. I could probably stand to revise some of my habits - I always like to think I'm living on the healthy side being a tea-drinker, but with 8-10 pitch black cups a day I'm probably pushing it! Thanks so much again, and hope you enjoy them. Haha! I was a bit surprised but very delighted that it turned out to be you, because you're delightful and it's difficult to remember to be anxious when you turn up. Hugs back! 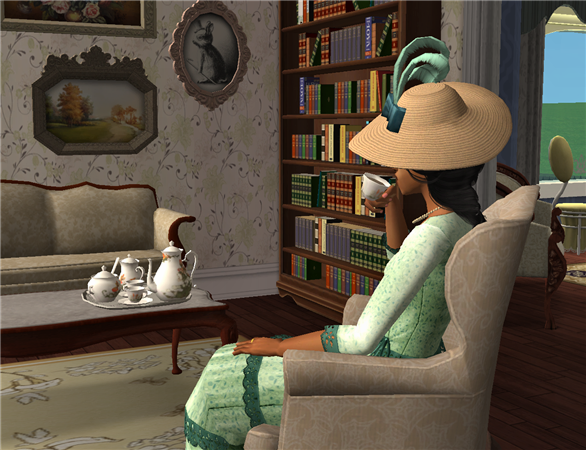 I'm glad you're enjoying the Edwardian CC. I've been looking for tea sets like this! I have problems with anxiety too, and CC making has been a way of coping for me. I'm sorry to hear things have been rough for you, but I hope things get better asap! Tank you! 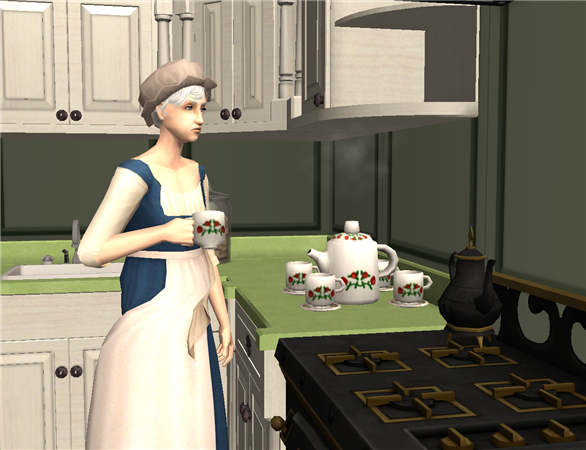 My sims are enjoying your coffee set, too. Thank you! Nice to see so many people playing historical 'hoods. 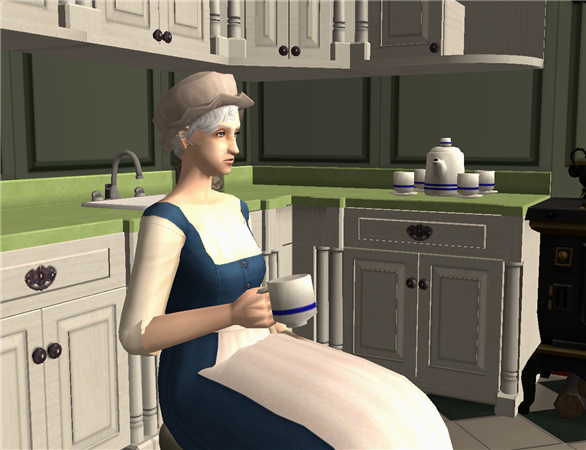 Recently, I fired up my Sims 2 and have been having a blast with it again. 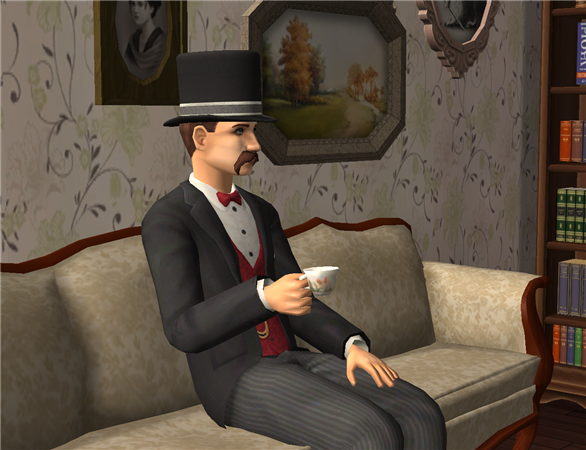 Thank you so much for your wonderful creations to make my new Sims 2 game even better than it was before. I'm glad to hear it! It's always great to come back to the game after a long time and rediscover it. Perfect for my 1920s game. Thank you so much for this! Edit: Ahahaha forgot I already commented on this. Oh well, it is twice as wonderful now!